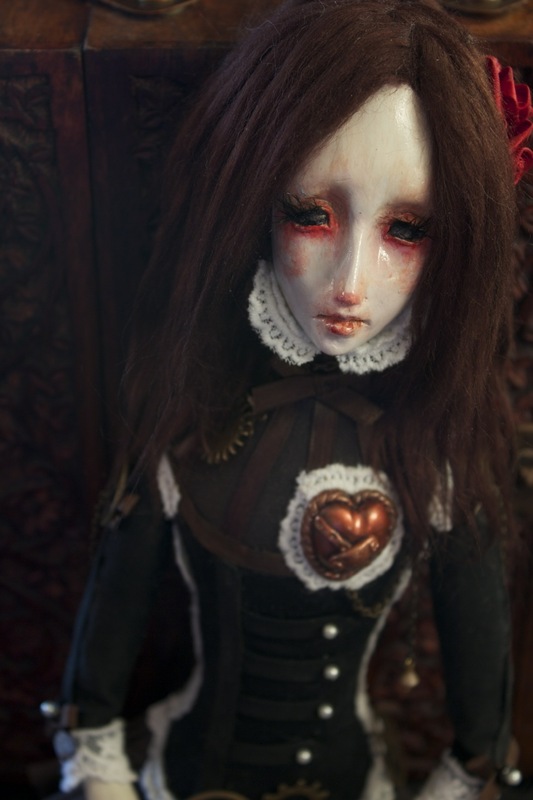 You can view more of my works and progress pics of all my dolls here. Another doll that I am currently working on. 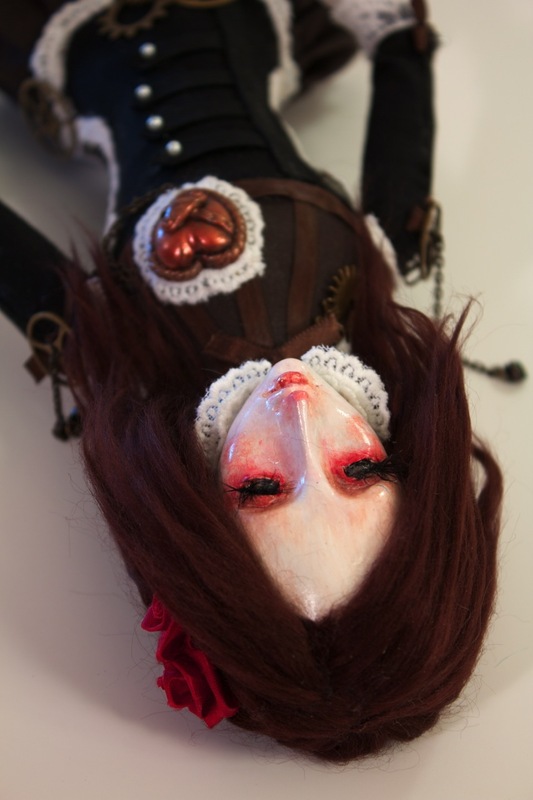 This is a doll that I had sculpted a while back, experimenting with my own handmade eyes. I put her aside and got busy on other projects and wasn’t sure if I would ever return to her nor what direction I wanted to go. Finally I got around to giving her some life and I decided to just play around and let her guide me. No planning, just playing and being completely spontanious. Sometimes I really enjoy it that way. I had some leftover gold trim from a previous costume so began to wrap her hair. From their I began to see her as some sort of goddess. I then envisioned her simply in gold and white dress…. You can follow more of my dolls and costumes here. My second custom piece, Aneira (which means Snow in Welsh). I was sent a drawing from one of my return customers who asked me if I could bring this to life. 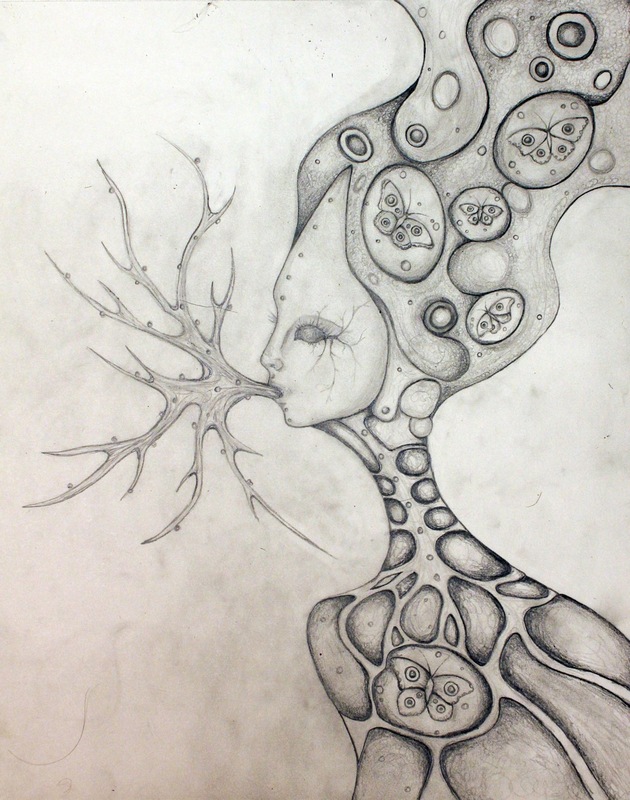 Drawings, as well as detailed descriptions are always the most helpful when making custom pieces because it allows me to see the vision that the person has in there head. She allowed me the freedom to experiment and do my own interpretation of her drawing however indicated that she definitely wanted to keep the colors in silver and white, wanted the hair pulled up, and wanted me to incorporate ice both on the costume and on the body. 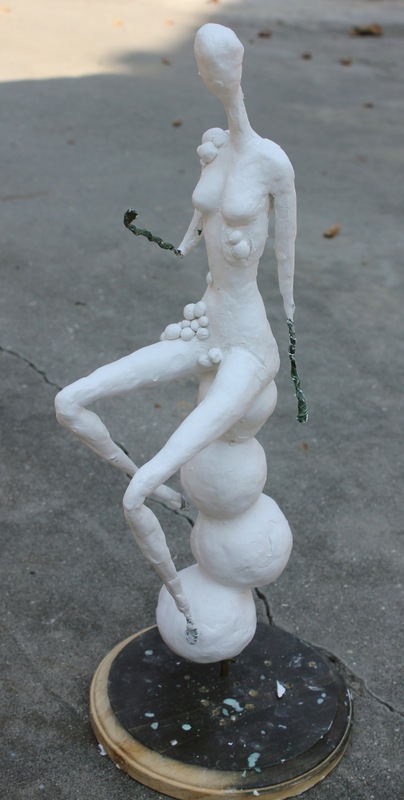 She then decided that she would like me to add horns and feathers along the skirt and if possible some form of wings. I sent her images throughout the process to make sure she was happy with the direction I was going. It was quite a fun process for both of us. I love the fact that custom pieces always give me new challenges. If you are interested in a custom doll please feel free to contact me for more information. You can see more of my dolls here. My new ooak art doll Lola is now for sale in my Etsy shop. 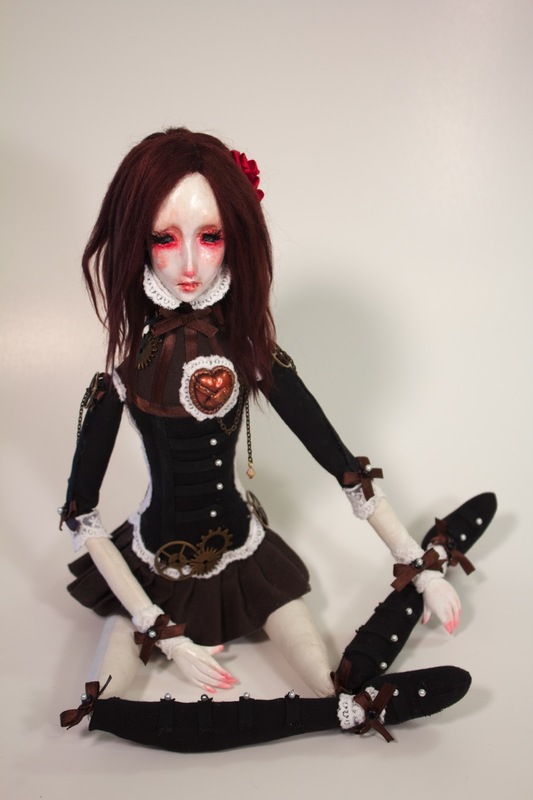 She is 100% handmade cloth doll with sculpted face and hands. She is adorned with various pink, red and black yarn stitches, red bows, gathered lace, lace hearts, and completed with a tattered hand sewn skirt and black vinyl boots. My newest doll, Isabella. She is 23″ long, and 11″ when seated. Her body, arms and legs are all stuffed using a high quality cotton. 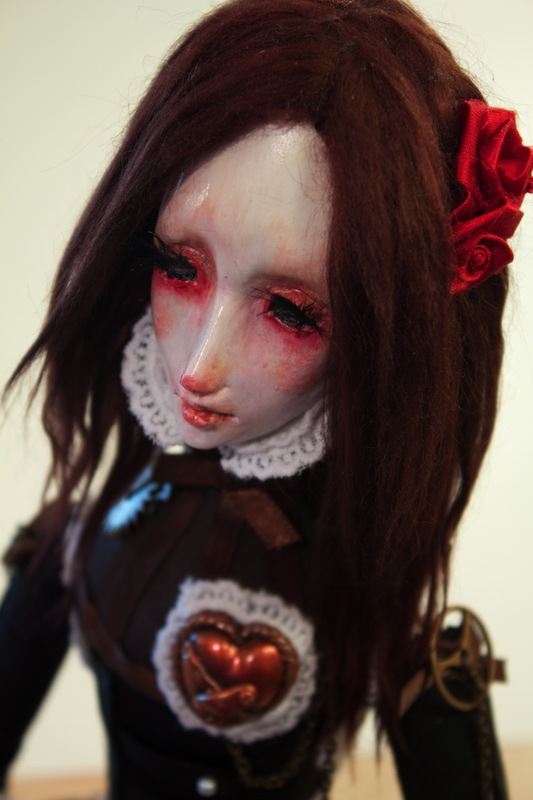 Her face and hands are made of La Doll Premier Stone clay. 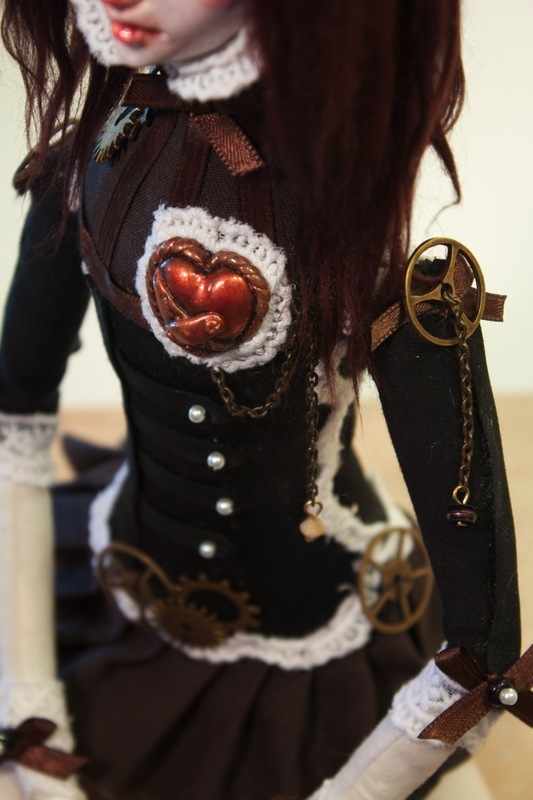 Her costume is entirely hand sewn, and adorned with pearls, lace, chains and gears. Her hair is made of viscose. The heart on her chest is an original design based off my jewelry and has been handmade using Cernit clay. All clay is hand painted , and finalized with a high quality varnish for protection. I decided to take a new approach to my dolls because as I have stated many times before, I get bored doing the same thing over and over again. Polymer clays are usually my medium of choice however they are so hard on my hands so I have been experimenting more with air dry clays. I also do a lot of sewing so I thought it would be interesting if I were to combine a stuffed doll with clay faces and hands. I think I will experiment with this style a bit more. It’s been quite a while since I last wrote in this blog however I assure you that I am still alive and working. In fact my scattered little brain is going back and forth between working on several projects and conjuring up new ideas that I am starting to tire myself out. My poor brain never wants to rest!! 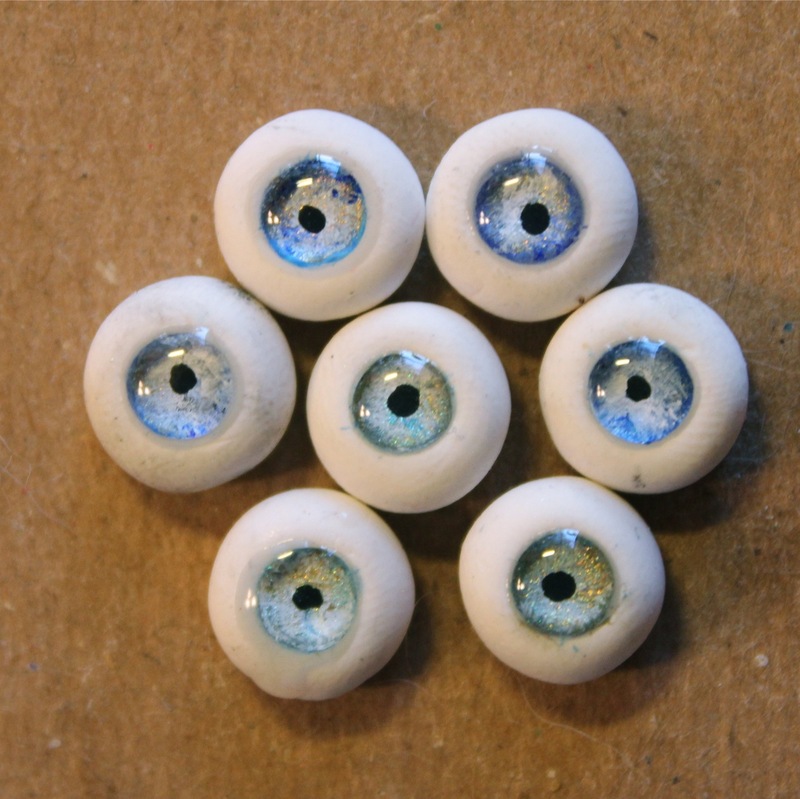 I have a new ball jointed doll that I finally completed all the body parts for, minus the face and I have an idea brewing that I think is gonna be really interesting….that is if it comes out how I am envisioning it. That is always the challenging part! As usual, working on my ball jointed dolls tend to take up lots of my time. It is such a long tedious process that I decided to begin experimenting with other methods so that I can give my poor hands a break as well as give myself some variety. I love making ball jointed dolls however the body sculpting part tends to be rather redundant and as I may have already mentioned a million times I tend to get bored easy. Hand sculpting my 5th ball jointed doll really made me come to the realization that I should really considers casting them. I thought about resin however I have heard the fumes are pretty strong and being the health conscious paranoid girl that I am has made me stray away from using it. I am saving up for a ceramic kiln so that in the future I can make them in porcelain. Sadly, it may be some time before I am able to afford it 😦 ……but it WILL happen….one day. I decided to take a break from polymer clay and more towards Premier Stone Clay for a bit and I have to admit I am LOVING it. I hope this doesn’t sound strange but I somehow find it very relaxing and therapeutic to sand my sculpts.This stuff sands like a dream !!! So far what I have it pretty rough and needs a great deal of work but I guess I can show it anyway. I usually despise showing works in progress when they are this rough so don’t judge it too harshly. It is still in the beginning stage. I also have another doll that I am working on however I will post pone showing her until she is a bit more completed. Her face still needs a bit of work before she makes her debut. Oh and I also have two new ideas I have built the armature for but so far I don’t have anything to show just yet. In the meantime here is a sketch for a bust that I will be working on. I will post images soon.